Special Announcement: MattG is 50 today - get the story! Internal Page All: Attention, we have a special announcement. Please drop your soldering irons and close your e-mail. There is a special birthday today - somebody has turned 50 years old! Matt Gilliland and everybody, please come up front to eat some cake! Of course, MattG didn't hear the message because he was in the router/laser room. The cyclone was spinning 1500 CFM and all he was thinking was about getting a fixture made for the selective soldering machine. Amidst the noise, MattH (the other Matt) retrieved the 50-year-old and brought him forward so we could force him into his very own party. Present at the party was the whole crew plus Matt's special friend Carl, who brought the cake to Parallax. As MattG really likes his work and Parallax customers, I felt it was an event worth sharing. Happy Birthday, MattG! We appreciate everything you do! Welcome to the "old farts club" Matt! February birthday people are special! Hey, 50 is the new 49! HBD Matt! You & Heinrich Hertz share the same B-day! That should get you 10% off your next car rental! Happy Birthday Matt. Those cakes look kinda tasty. I've been 50 for 11 months now, and I'm telling you, it's all it's cracked up to be. Here's where the real fun begins. Happy birthday Matt. Remember if you measure your age in seconds 50 isn't that different from 40. Blessed 50th Birthday! I sure hope Ken gives you a day off! Haha! I'm starting to forget what it was like to be 50.....but I'll take your word for it! Whoa! Matt, Tony is right. You get your birthday off at Parallax! I am truly a blessed man. The culture here at Parallax is profoundly optimistic and encouraging! And, as if that were not enough - about a month ago, I got a new *official* email address: MattG@parallax.com. Those are empty words Chief - my ankle shackles are rusted shut. Happy Birthday Matt from Parallax: Plumas Lake! happy b-day matt! did you get shrimpz? thatz important. and never stop chasin birdz or findin time fer a good nap, and yul stay yung! Lordy, Lordy, I thought I was OLD at 40! -- JUST KIDDING MATT! You don't look a day over 38! Happy B-day from the Mardi Gras aftermath. I'm hot on your heels -- turned 48 myself on the day after Valentine's. You know how that goes, in a few more years we'll be the same age. Happy Birthday Matt. 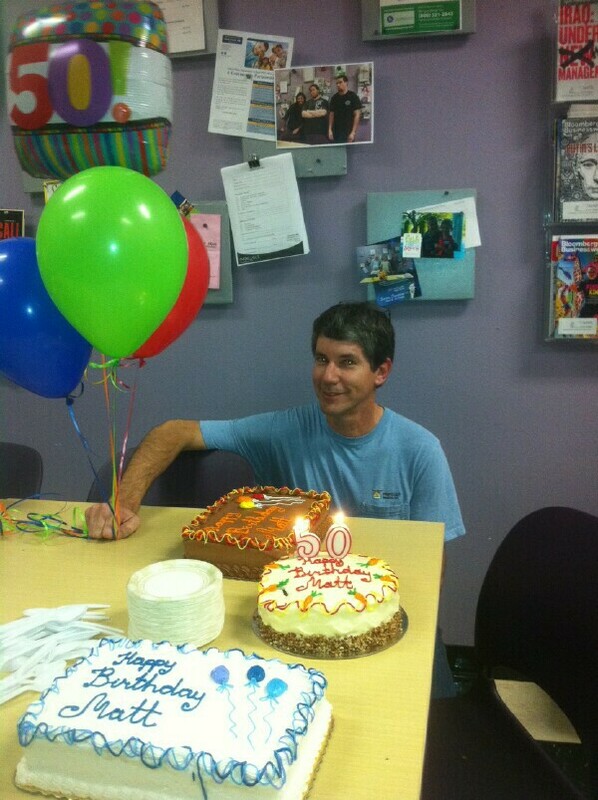 50 is good..gray hair is good! Welcome to the still young generation. I guess those three cakes will take the place of three doughnut days. Sounds like an excellent time! Will Maddie be back to join us this summer. I'm sure the gun will make to UPEW. Now that I said that, it makes me worry a little bit...hummm. We thought you were coming, so we turned up the heat to 75 plus on the beach... but you were no show. You know we don't turn up the heat for just anyone..
Oh well, you know the drill, give us a call when you come to town, thats if ken ever lets you out of the sweat shop.